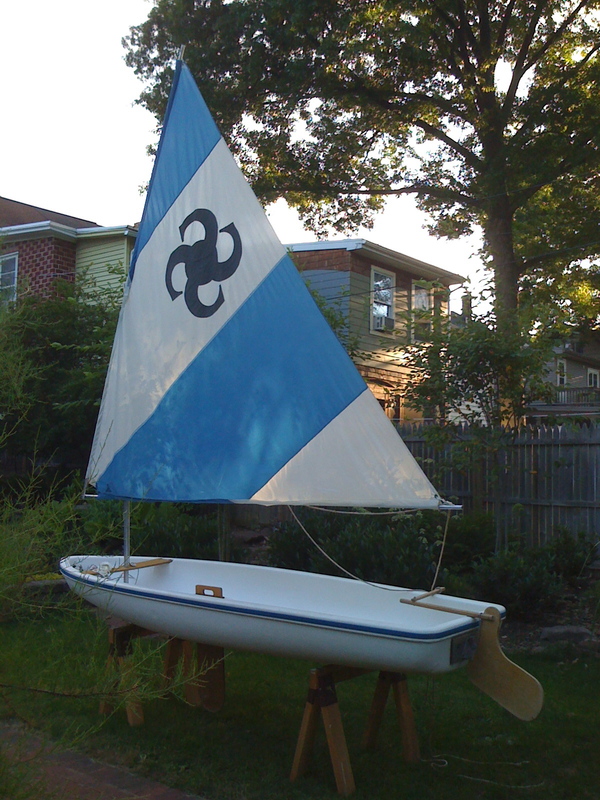 I just bought this sailboat, an 11′ Super Snark. I’ve wanted to learn to sail for a few years—this seemed like the perfect sailboat with which to start. It is purportedly unsinkable and very stable. The ABS clad EPS foam hull certainly seems very durable and indeed, could not possibly sink even if completely swamped. I had it out for the first time this weekend and had a fantastic time. This was my very first time sailing, but I found the boat quite easy to handle – the basic sailing instructions I’ve read were enough to get me underway with this small sailboat. With a little ‘effort’ I was even able to capsize the Super Snark and shortly thereafter learn how easy it is to right this boat. I’ll save the details of that story for another time. After the first trip out I realized that all the wood parts – rudder, tiller, keel, transom – needed some attention. The marine plywood rudder was delaminating, and though it would be simple to cut a new one, I thought it might be worthwhile to repair it. After gluing and clamping the rudder in several places, I sanded and varnished all of the wood parts. I also plan on painting the outside of the hull – navy blue. I’ll keep the white gunwhale and medium blue bumper as is. This motif should work nicely with then existing blue-white-blue-white striped sail and equally well with an Egyptian cotton colored sail I’d like to have. Want a New Snark Sailboat? I was surprised to learn that Snark sailboats are still being made – not only the Super Snark, but also the Sea Skimmer, Sunflower, and others. If you don’t have the time or inclination to repair an older boat, a shiny new Snark is still a relatively affordable way to start sailing. Here are a few links to the best prices available through Amazon. Splash Deck – I am planning to sail in the bay at Stone Harbor, New Jersey in late September. It can get choppy there – and while the summer boat traffic will have diminished I have yet to deal with the wake of a decent sized powerboat. The splash deck covers the area of the otherwise open hull from the mast step forward to the bow, shedding water the boat might take on from chop and wake. Coming over the bow. I am nearing completion of a wooden splash deck and I am excited about my design and the results. I will post photos and detail soon. Boom Vang – Provide downward tension on the boom for better sail shape and to minimize ‘bounce’. Use the free end of the halyard through the gooseneck of the boom and back to the cleat. Traveller – create a bridle using a short length of line between the two screw eyes on the inside of the transom, leaving enough slack in the line to come up and over the tiller with clearance. Thread a small block on the bridle before fastening the line on the eyes. Then the tack end of the main sheet is secured to the dead eye of the block allowing the tack to travel along the bridle. Tiller Tamer – Loop a short bungee cord around the tiller and connect to the screw eyes on the inside of the transom. This should exert just enoungh tension on the tiller to bring the rudder back to center when the tiller is released. Daggerboard Retainer – attach on or two screw eyes into a small plywood plate on the stern end of the daggerboard trunk. From these eyes, run a bungee cord around the aft edge of the daggerboard. Pulling on the bungee allows the daggerboard to be raised or lowered – releasing it should hold the board in any vertical position. Kickup Rudder – Design and make a two-piece rudder to replace the old one-piece rudder, allowing for easy beaching of the sailboat. I just bought my first sailboat, a 1972 Sea Snark. It has the ABS coating but is bubbling and cut in places. Is this something I will need to replace and cover with fiberglass or is there and easier way to eliminate the bubbling and fix the small cuts everywhere. Not opposed to the fiberglass and it will have a great finish – just don’t have any clue what it’d be doing. Doesn’t look terribly hard to do though. Thank you for any help. P.S. This is a great forum, thank you very much for creating it. Lots of great help, ideas and information. Am I the only person in the world to own Snark Mayflower??? Mine needs some minor hull repairs, but its a wonderful boat. I am “older” and cannot handle the heavier boats, so this boat is great for me. I am wondering if anyone has made a pvc trolley for a 90# (without rigging) boat? I am thinking something with a sling in the rear? I plan to use larger all plasitc wheels, but the design is making me nuts. In the past have used a prebuilt hand cart with wood handle extensions, but now I want the stern at the rear of the trolley and that is the problem….suggestions? Also, when you painted did you remove the rubrail and what was that like??? I Love this site! Thanks! Marci, not sure if you are still out there, but my dad is trying to repair the hull on our Mayflower, which we’ve been sailing on a small pond for years. He is 86 now. Years ago it smashed against a tree (the wind picked it up) and snapped in half. He repaired it at the time, but over the years it has taken on water, with a particular crack around the centerboard well. This summer he removed part of the skin and patched some of the holes in the foam with sections he created from an old styrofoam beach board. He also plans to build up the well internally. Not sure when he’ll be able to finish. I miss it dearly! I’ve tried buying a new hull for him in the past but could never find any for sale.Happy sails to you. I can’t help you, except to say that, yes, someone else once owned and enjoyed the Snark Mayflower from 1974-1978. I used to carry it on my back over the rocks at Folly Cove on Cape Ann, Massachusetts each time we wanted to sail. My wife is writing a memoir of an one hour Gilligan’s Island sail that four of us took across Ipswich Bay in gentle swells . By the time we reached Plum Island seven hours later, they had turned into 10 foot breakers. Yes, a wonderful boat, so sturdy for being only a piece of foam and plastic. I found your post because my wife didn’t believe it was called a Mayflower, and I had began to believe our little Mayflower never existed. Do you have any pix? Love to see one again. I just acquired an old super snark – no sail, rudder or daggerboard. I got it to learn to sail. I had read that this was the way to go and I thought I got a great deal – $40. However, I am now concerned – the thing is a lot more than 50 lbs. it took my husband and I a lot of effort to lift and slide into our van. Someone suggested water issues? Could there be a heavier model out there?. This has some kind of coating over the styrofoam. any thoughts to help me figure out whether to invest more money into parts. Peter, there are some photos of the Snark Mayflower here. I am a writing coach—you can find me at my writing coach dot net if your wife needs any help with her memoir! We are not far from Plum Island and would love to hear the tale. Dear all, how nice to found you all in the www. My Sunflower hull is delaminating arround the dagger board. Does someone have ideas and experiance in how to fix this? Is there a overview of serial-numbers available, that will tell the year of manufacture? Last fall I saw a Sea Snark at a thrift shop and got it for $65. 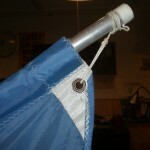 A small hole in the sail but serviceable. A busy spring / summer but finally got my chance to sail two days ago. Wow what a rush. I went out in 3 mile/hour wind and gradually increasing to 5. The wind was was fluky and changing direction and after 2 1/2 hours this old guy at 69 was bushed. Looking at videos and instructions for rigging the main sheet I could see many versions. I saw one photo with a traveller. I wondered about needing a hiking strap but wondered if the hull might crack in half. Reading here about a bow splash. My idea is to keep the boat light so I will not add anything slick to the styrofoam. I think I should graduate to a bigger boat for such niceties. Going sailing alone on this craft is the way to go and encourage others to club for racing. This Sea Snark and some lawn mower racing. Retirement is great. Thanks to all to you who have suggested repairs and improvements to this newbie. Wow…happened to come across this site and am glad to have found it. Snagged an older Snark from neighborhood group site (!) and been out three times so far – is great! 1) I want to fortify hull – Snark people suggested using 2 part epoxy, but NOT marine grade (will melt the styrofoam) – any suggestions on a decent, but reasonable option and how much it takes to do the whole hull? 2) The third time we went out, my son and I were going pretty fast but maybe because we were causing a bit of waves (?) the boat suddenly filled with water – less than a minute. Yikes! I had to bail like a madwoman (once the water is higher than the centerboard hole it is pretty hard!!). I need to make a splash guard – can you post a pic of the one you made? So many thanks!! 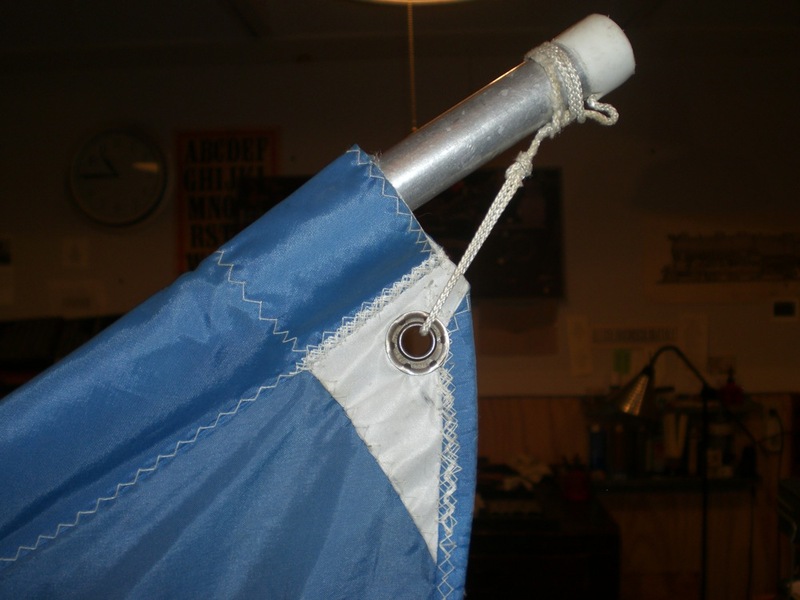 What do you do when you’re on the water, swilling and you need to put the sail down? I have a super Snark. The sail does not come down at all and in very windy conditions, this could be dangerous. I am coming late to the party here, but just retired and am determined to get my “freebie” 1969(?) Mayflower in the water. I had to buy a new sail for it because the one on it was roached. Is there somewhere I can see a diagram to show this newbie how to properly rig this little boat? Thanks in advance! I have found an excellent repair for styrofoam to the plastic hull. I fixed the centerboard trunk works excellent. It’s called 5200 from 3M, very messy but works great an won’t harm styrofoam. I got it at Home Depot, an it’s not cheap. $14.00 a tube. I have a 11′ Snark Sunflower in my garage (it was left by the home’s previous owner). It looks in great shape, as if it rarely saw the water! If anyone has an interest in purchasing, please contact me. I’d be happy to send pictures to anyone interested. I have a super snark. we stored it in a storage unit for a number of years. but my dad back in the 80s took 4 inch PVC and put two screw fittings on the ends and created a tube to protect the sail during transport and storage. Hey! I just got a Snark Sea Skimmer off of craigslist for just a few dollars. The Hull is in pretty bad shape (lots of duct tape patches) and the deck has some cracking i’m sure from age. It is in one piece tho and all of the pieces parts are there. Any suggestions on where i should get started on repairing the Hull? Products, techniques? hull, a few dents and cracks with PC-11. Going to sand it a bit and then paint it. The original color is red but I may want to change it. Just wondering how the Krylon Fusion paint held up. I also think the Navy blue would be beautiful! Enjoying learning from fellow sailors! I just did a Super Snark restoration in August and September. There is a yahoo user’s group for Snark sailboat owners which is active and helpful. I have a photo album there showing my restoration from a hull that sat in the weeds for years to a fun and portable sailboat. Good luck! I used Krylon fusion on my Snark and it worked great! Hey I was wondering all the dimensions of the Rudder and dragger Board? I received a super snark in excellent condition for free. it just doesn’t have mast sail dragger board or rudder and I plan on making most of it my self any help or suggestions will be appreciated! New to sailing so be easy on me! Thanks again! I’m about to buy a very old snark, the unclad Kool cigarette version. Has anyone had any problems with these, as far as the hull breaking or getting waterlogged, etc.? Does anyone know what happen to the Snark Sailboat Owners Yahoo Group? I just bought a Sunflower. I have joined, but being a restricted group, its been more than a week and I have not heard back. I also tried to go to the group website and it is not working. (www.wisdomsecurity.com). What I wanted to know is: Has anyone set up a jib on a Sunflower? How did it work? How it was done? Thanks. I have a 1972 Kool Snark. Smoked Kools to have required cartons and $99.00 to buy it. We did an amateur fiberglass job on it in 1972 but it has served the family well on lake and beach adventures.